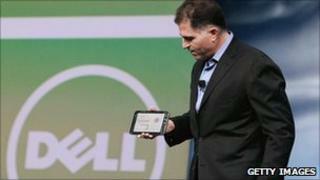 The founder of the computer giant Dell Inc, Michael Dell, has bought another $100m of shares in the company. The company confirmed the move, which was made on Friday and filed with the Securities and Exchange Commission. The purchase, of 7.37 million shares priced at $13.57, gives him 263 million shares valued at $3.5bn and makes him the company's largest shareholder. In an interview earlier this month, Michael Dell argued that some investors were not valuing the company enough. Dell's shares have fallen 7% this year. Shares in the company closed down 2.1% on Monday. Dell's latest results, released a month ago, showed third quarter net income rose by 144% rise to $822m (£511m), thanks to falling costs and a post-recession wave of IT upgrades. Revenues in the three months to September rose 19% from a year ago, driven by corporate orders. In contrast, the computer manufacturer reported only a 4% rise in takings from consumer clients, as household spending on laptops and PCs remained weak.